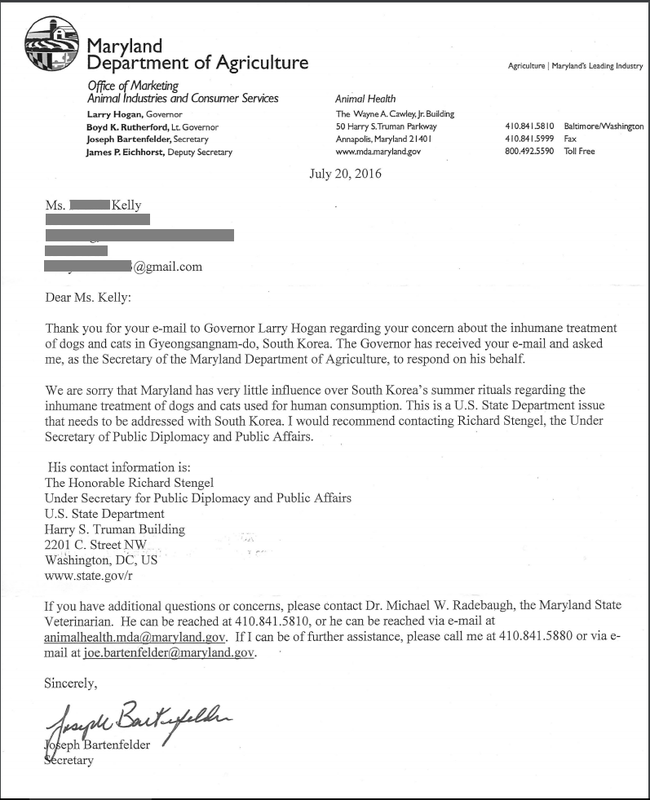 Home / Blog / Unsatisfactory Response from Maryland regarding Sister State – Gyeongsangnam-do, South Korea. Although we sent a letter to the State of Maryland, we have not received a response. This is not the response we had hoped for, and we do not agree that the State of Maryland has “very little influence” over Korea’s dog meat cruelty. We nevertheless appreciate their effort for responding as majority of our petition recipients do not. At this point we can try writing to “The Honorable Richard Stengel” with the U.S. State Department as they have suggested as well to keep writing to the state of Maryland to take action. Photo: Busan KAPCA (Busan Korea Alliance for the Prevention of Cruelty to Animals). 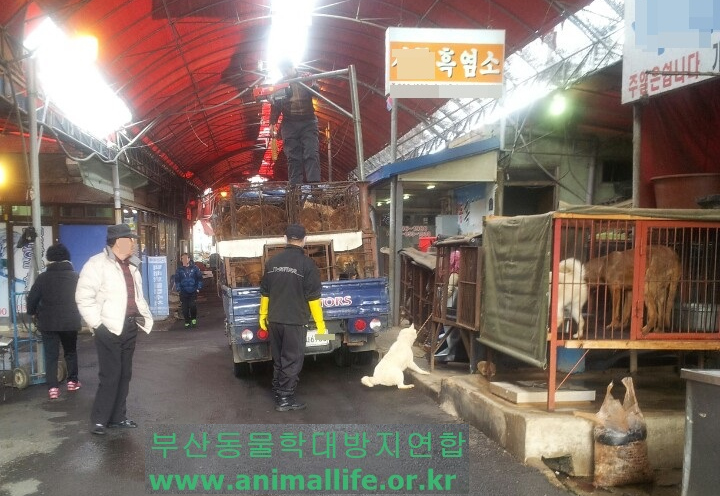 Busan Gupo Dog Meat Market, Gyeongsangnam-do, South Korea. BASTA CON QUESTI MASSACRI METTIAMO A MORTE TUTTI GLI UOMINI AL POSTO DEGLI ANIMALI MAGARI CHI LI UCCIDE A SANGUE FREDDO CIOè SGOZZANDOLI O CHI LI METTE VIVI NELL”ACQUA BOLLENTE PER CUOCERLI O BRUCIARLI ANCORA VIVI CON LE FIAMME OSSIDRICHE IO VOGLIO CHE QUESTO ORRIBILE TRATTAMENTO SIA FATTO A TUTTI GLI UOMINI E DONNE DELLA COREA E DELLA CINA 1 CANE MASSACRATO 1000 CINESI O COREANI UCCIDERLI NELL”ACQUA CALDA E SICCOME SARANNO STATI CIRCA UN MILIARDO CHE SONO STATI UCCISI FATE I CONTI VOI è LA VOLTA BUONA E 1 SOLUZIONE PER DIMINUIRE LE POPOLAZIONI COREANE E CINESI ECCO COME RISOLVERE IL PROBLEMA FAME NEL MONDO UCCIDERE I COREANI E I CINESI PER SFAMARE CHI NON HA NULLA DA MANGIARE E POI SE SPARISCE QUALCHE CINESE O COREANO CHI SE NE ACCORGEREBBE?